To + verb root. 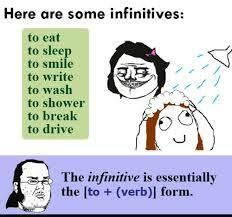 In English, here are some infinitives. How do we use the infinitive form? Let's take for example the infinitive form 'mokaon' which means 'to eat' in English. English: I like to eat fruits for snack. Binisaya: Ganahan ko mokaon og prutas para sa miryinda. English: I want to eat chicken later. Binisaya: Gusto ko mokaon og manok unya. English: It is difficult to eat shrimps. Binisaya: Lisod mokaon og mga pasayan. English: We need to eat vegetables. Binisaya: Kinahanglan kita mokaon og mga utan. English: We should eat vegetables. Bisaya: Angay kita mokaon og mga utan. English: You may eat roasted pig later. Bisaya: Puydi ka mokaon og litson unya. If you look at the Visayan version, there are words in the sentences that are shaded green. Can you read them? These are gusto (want), ganahan (like), kinahanglan (need), angay (should), puydi (can/may). The infinitive goes basically with these words and of course, it is used the same way it is used in English. Basically, the usage of infinitive form in Visayan is similar to English.